With a highly polished finish, the stainless steel 30 piece Manchester Cutlery Set is an appealing addition to your dining table. Each piece in this comprehensive 6 person set is crafted for durability and the set is gift boxed for giving or storage. The Stanley 40 pc Stanley Rogers Madrid Cutlery Set brings value to the table with an included set of 8 steak knives. Crafted from quality 18/0 stainless steel, the 8 person set is dishwasher safe and includes. Trending at AU $81.92eBay determines this price through a machine-learned model of the product's sale prices within the last 90 days. Children will love the Australian animals on each handle - koala, wombat, kangaroo and kookaburra. Designed specifically for smaller hands. 100% Australian. 1 Small Spoon. 1 Large Spoon. Suitable for children 3 years and older. The Stanley Rogers Manchester Cutlery Set 56 Piece combines effortless design with outstanding quality to create a cutlery set that is exceptional in any circumstance. The quality of the materials used in the Stanley Rogers Manchester Cutlery Set 56 Piece ensures a comfortable and enjoyable user experience. Amsterdam Cutlery Set features Set an elegant dinner table with this beautiful 56-piece AmsterdamStainless Steel cutlery set. Presented in a Stanley Rogers gift box. Made from 18/0 stainless steel. STANLEY ROGERS PISTOL GRIP STEAK KNIFE SET OF 6. It's got the elegant look and feel you'd expect from Stanley Rogers cutlery.but the shape of a Wild West Six Shooter! Stanley Rogers' Pistol Grip Cutlery is stunning to look at, comfortable to hold.and yet, strangely funky. 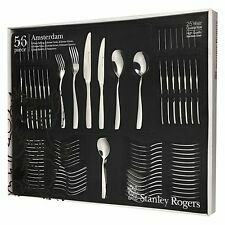 NEW 84 Piece Albany Cutlery Set - Stanley Rogers - Cutlery Sets. Beautiful cutlery adds the defining touch to any table setting. Established in 1930, Stanley Rogers has thrived through generations, providing traditional quality and classic style. STANLEY ROGERS 56 PIECE CAMBRIDGE CUTLERY GIFT BOXED SET. 56pc tableware set. Made from premium 18/10 stainless steel with a Mirror Polish finish. Presented in a Stanley Rogers gift box ready for gifting. BUY PARTICIPATING ON THIS WEBSITE AND PURCHASING KNIVES YOU AGREE THAT YOU ARE 16 YEARS OR OLDER AND UNDERSTAND RULES AND REGULATIONS IN RELATION TO KNIVES IN YOUR OWN STATE OR TERRITORY. Greet guests to an impeccably laid table with the Sheffield 50-piece cutlery set. Crafted from the finest stainless steel and balanced to perfection, each piece looks divine and feels wonderful in the hand. NEW Stanley Rogers Children’s Sea Animals 4 Piece Cutlery Set. 1 Small Spoon. 1 Large Spoon. Children will love the sea animals on each handle - seahorse, turtle, clown fish and octopus. Designed specifically for smaller hands. This comprehensive set is crafted from 18/0 stainless steel for durability and appeal and is gift boxed for giving or storage. Albany Cutlery Set features Beautifully presented in a Stanley Rogers gift box. The Stanley Rogers Oxford Cutlery Set 50 Piece is made from high quality stainless steel, with mirror finish, to ensure durability for the toughest tasks. Each piece is beautifully designed with a flattened square shape that is elegantly decorated and highlighted with engraved grooves while the steak knives have the traditional three rivet strength handles. Stanley Rogers has been creating exceptional cutlery for over 80 years. Coming from humble beginnings repairing and sharpening silverware. This unique set from Stanley Rogers has a stunning blossom, satin finish design on the handles in the traditional Albany silhouette. 100% Genuine! STANLEY ROGERS Albany 12 Piece Buffet Forks Set Stainless Steel! Each piece is carefully designed with a flowing rounded shape that is organic, natural and fits comfortably in hand. 100% Genuine! 12 x Buffet Fork. About Stanley Rogers. It’s refined; it’s unique; it's beautiful. 4.5 out of 5 stars - 100% Genuine! STANLEY ROGERS Albany 12 Piece Buffet Forks Set Stainless Steel! 5 product ratings5 product ratings - 100% Genuine! STANLEY ROGERS Albany 12 Piece Buffet Forks Set Stainless Steel! 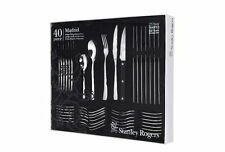 NEW STANLEY ROGERS Oxford 56 Piece Cutlery Set For 10 People, RRP $249.00! With over 75 years of experience, Stanley Rogers cutlery is created on the finest silver smithing traditions. Stanley Rogers cutlery is designed to impress. Stanley Rogers Cutlery Set 56 Piece Oxford - Setting Stylish Tables for Over 75 Years. 5 out of 5 stars - NEW STANLEY ROGERS Oxford 56 Piece Cutlery Set For 10 People, RRP $249.00! 6 product ratings6 product ratings - NEW STANLEY ROGERS Oxford 56 Piece Cutlery Set For 10 People, RRP $249.00! STANLEY ROGERS ALBANY 50PC CUTLERY SET FOR 10 PEOPLE. The Stanley Rogers ALBANY Cutlery Set 50 Piece is made from high quality stainless steel, with mirror finish, to ensure durability for the toughest tasks. 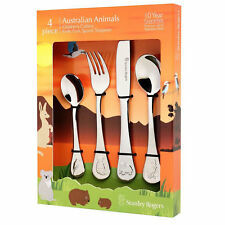 Stanley Rogers Children Cutlery 4 pcs Set Australian Animals | Stainless Steel. 1 Small Spoon. 1 Large Spoon. Childern will love the sea animals on each handle - seahorse, turtle, clown fish and octopus. 12 piece Baguette Parfait Spoon Set. Established in 1930, Stanley Rogers has thrived through generations, providing traditional quality and classic style. Beautiful cutlery adds the defining touch to any table setting. This simple, flawless cutlery collection is lightweight and unobtrusive, and polished to a brilliant gleam as well. 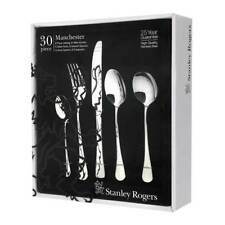 STANLEY ROGERS MANCHESTER 50PC CUTLERY SET. Manchester Cutlery Set features You’ll find Stanley Rogers' wares on tables all over Australia; each piece brimming with refined, understated style. 8 x 23cm Steak Knives. It’s refined; it’s unique; it's beautiful. It’s Stanley Rogers. Since 1930, Stanley Rogers have been masters of the art of beautiful, yet practical cutlery. What is it that makes them so special?. Since 1930, Stanley Rogers has stood as a mark of excellence in dinnerware. Setting Australian tables with distinction and style, their beautiful cutlery is created with the finest silversmithing traditions, gleaned from across the world. 100% Genuine! STANLEY ROGERS Bolero 56 Piece Cutlery Set! RRP $299.00! 100% Genuine! STANLEY ROGERS Bolero 56 Piece Cutlery Set! Set an elegant dinner table with this beautiful 56-piece Bolero Stainless Steel cutlery set. 8 x Stanley Rogers Bolero Table Knives. 8 x Stanley Rogers Bolero Table Forks. 4.5 out of 5 stars - 100% Genuine! STANLEY ROGERS Bolero 56 Piece Cutlery Set! RRP $299.00! 7 product ratings7 product ratings - 100% Genuine! STANLEY ROGERS Bolero 56 Piece Cutlery Set! RRP $299.00! This lovely cutlery set was made by Stanley Rogers. Featuring the Virgina pattern, it consists of a complete setting for 8, 56 pieces in total. Get images that. Your table will look particularly smart when it’s set with Stanley Rogers’ Cambridge cutlery. Crafted from stainless steel, polished to a superbly lustrous finish, Cambridge exudes enough English charm to lend any dinner setting a degree of excellence. A contemporary floral pattern adorns the handles. High quality stainless steel. Satin oxidised finish. Colour Stainless steel and matte black. Material High Quality Stainless Steel. In the event of any unforeseen delay, we will be in touch and keep you updated on every step of the way. Established in 1930, Stanley Rogers has thrived through generations, providing traditional quality and classic style. Stanley Rogers has a long tradition of designing and creating quality stainless steel products to enhance the cooking and dining experience. Lovely cutlery set made from high grade stainless steel - I have 2 of these available if you wanted 112 pieces in total (unless sold prior). high quality stainless steel. 56pc tableware set. Stanley Rogers Clarendon is a Quintessentially English design. Experience the clean classic lines of Clarendon. Threaded patterns date back to mid 1700s. Made from premium 18/10 stainless steel with a Mirror finish. 100% Genuine! STANLEY ROGERS Baguette 42 Piece Cutlery Set 18/10 S/S! RRP $299! STANLEY ROGERS Baguette 42 Piece Cutlery Set 18/10 S/S! The Stanley Rogers Baguette Cutlery Set 42 Piece combines effortless design with outstanding quality to create a cutlery set that is exceptional in any circumstance. 100% Genuine! Stanley Rogers Albany S/S 56 Piece Cutlery Set! RRP $299.00! 100% Genuine! Stanley Rogers Albany S/S 56 Piece Cutlery Set! Stanley Rogers Albany 56 Piece Cutlery Set! Since 1930, Stanley Rogers have been masters of the art of beautiful, yet practical cutlery. These cutlery sets adds a flair to any dining table with their stunningly classical designs. 10 x Stanley Rogers Oxford Dinner Knives. 10 x Stanley Rogers Oxford Dinner Forks. 10 x Stanley Rogers Oxford Steak Knives. This smart and sophisticated set of silver-tone cutlery from Stanley Rogers instantly adds a touch of class to your dining table. Crafted from high quality stainless steel with a brilliant mirror finish, this 56-piece, 8-person place setting includes all the utensils you need for your next formal dinner party or special family gathering. Made from durable 18/10 stainless steel, the classical structure of this cutlery set brings a touch of pure class to the table. Stanley Rogers 70 Piece Baguette Cutlery Set. Made from high quality 18/10 stainless steel with a glossy finish. 100% Genuine! STANLEY ROGERS Clarendon 56 Piece Cutlery Set 18/10 S/S! RRP $399! The Clarendon design is a decoration of a simple thread border that trims the subtle curves of each handle. This subtle design coupled with the mirror polish finish makes the Clarendon cutlery set a classic set that will never date. 5 out of 5 stars - 100% Genuine! STANLEY ROGERS Clarendon 56 Piece Cutlery Set 18/10 S/S! RRP $399! 2 product ratings2 product ratings - 100% Genuine! STANLEY ROGERS Clarendon 56 Piece Cutlery Set 18/10 S/S! RRP $399! 56pc tableware set. Made from premium 18/10 stainless steel with a Mirror Polish finish. Presented in a Stanley Rogers gift box ready for gifting. Made from stainless steel. BUY PARTICIPATING ON THIS WEBSITE AND PURCHASING KNIVES YOU AGREE THAT YOU ARE 16 YEARS OR OLDER AND UNDERSTAND RULES AND REGULATIONS IN RELATION TO KNIVES IN YOUR OWN STATE OR TERRITORY. 100% Genuine! STANLEY ROGERS Quilted Albany 32 Piece Cutlery Set! Stanley Rogers. Stanley Rogers has been creating exceptional cutlery for over 80 years. Coming from humble beginnings repairing and sharpening silverware. 5 out of 5 stars - 100% Genuine! STANLEY ROGERS Quilted Albany 32 Piece Cutlery Set! RRP $199.00! 2 product ratings2 product ratings - 100% Genuine! STANLEY ROGERS Quilted Albany 32 Piece Cutlery Set! RRP $199.00! 70pc tableware set. Made from 18/10 stainless steel and polished to a satin finish. Presented in a Stanley Rogers gift box ready for gifting. 10 Entrée Fork. Made from 18/10 stainless steel. Polished to a satin finish. 100% Genuine! STANLEY ROGERS Albany 84 Piece Cutlery Set Stainless Steel! 100% Genuine! STANLEY ROGERS Modena 56 Piece Cutlery Set 18/10 S/S! RRP $399!